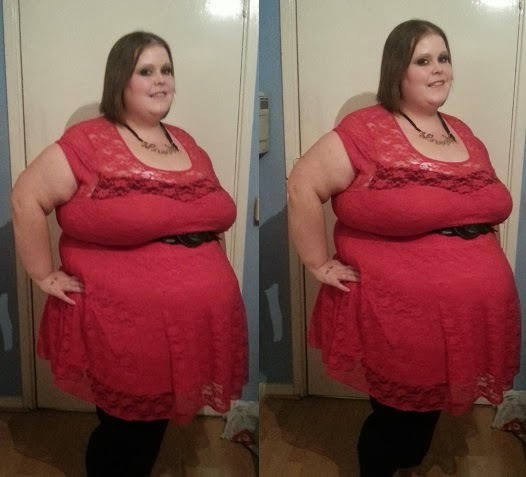 I have had this red dress from ASOS Curve in my wardrobe for a while, but haven't had a chance to wear it. This weekend I decided to be a lady in red for the Plus London After Dark Party and then my trip to BGP in the evening. I wore it with leggings (surpisingly I know!) and some sparkly silver shoes. I loved the fit of the top and enjoyed wearing it. The 'lovely' necklace gets SO many comments, it's a Primark bargain and I am so glad I picked up it when I saw it a few months ago! I don't often wear red, so it was a nice change for me - what colour do you like to wear? 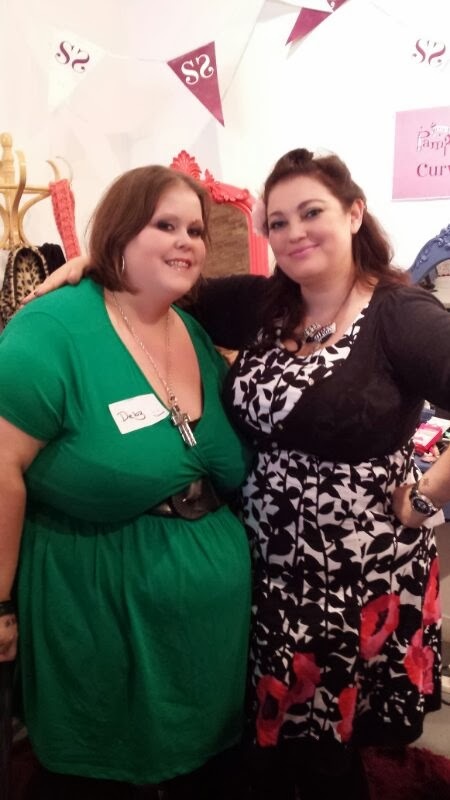 As you will probably have seen - I attended Plus London, a London based bloggers/plus size event last weekend. Leading up to the event I wasn't entirely sure what I wanted to wear - I knew I would be out and about all day, so I wanted to make sure I was comfortable as well as looked good... After all, with so many fabulous plus size bloggers in attendance I couldn't be left behind in the style stakes! In the end I opted for my green ASOS wrap around top, leggings and my trusty flats from Primark. The backdrop is the back of the Hoxton Arches gallery where Plus London was held - how amazing does it look? I had some professional photos taken on the day so I'll get those posted soon too! Did you attend Plus London? I lusted after SO many outfits on the day, so please send me links so I can lust some more! Plus London - My First Proper Bloggers Event! 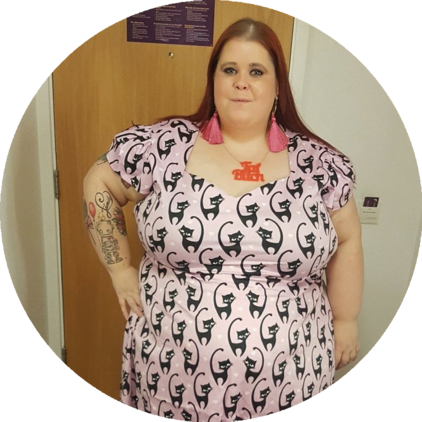 Last weekend I attended my first proper bloggers event - Plus London. I had heard good things about previous events and after missing out on Plus North I was really keen to attend. I have to say, the day did not disappoint. In fact I spent so much time having fun that I forgot to take too many photos - sorry! 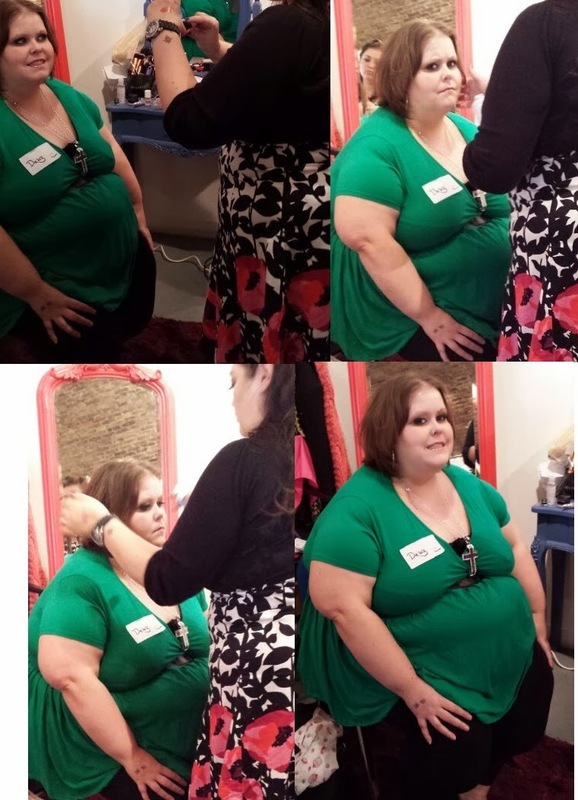 My day started with an amazing make over by the lovely Betty Pamper - I love looking at Bettys make up style and reading her blog, so having my make up done by her was a really treat and got my day off to an amazing start! Throughout the day we got to chat to the PR representatives from different larger companies (Simply Be, Taking Shape and Curvissa for example) and chat to people who started up some of the smaller companies we all know and love (Twisted Siren and Black Heart Creatives)... I was also introduced to a couple of companies I hadn't come across before which was great! We got to have our photo taken by a professional photographer (Photos coming soon!) and listen to talks by some of the brands about their loves, future plans and what they're going to be doing for us - and of course ask any questions that we might have! The day part of the event was finished with a fantastic performance by The Diablo Daniels - who was amazing! Then we all headed off for a few hours, before coming back for the After Dark part of the event - with some, interesting shots on offer by the Plus London Team! We got to take fun photos with a variety of props, have a chat to everyone and have a bit of a dance - so much fun! Apart from a couple of launches, I haven't really attended a 'proper' blogger event and I am glad I did - It was so nice to meet the people behind the blogs I read and chat to the brands properly. Thanks to the whole Plus London team for a marvellous Saturday! Did you attend? Send me your write up links, I'd love to read them!